Last night Fabian Cancellara confirmed to us that he had abandoned the Tour and did not start stage 11. The three attackers were Anthony Delaplace (Bretagne), Cyril Lemoine (Cofidis) and Martin Elmiger of IAM Cycling. Peter Sagan, still waiting for a stage win, had his Cannondale team at the front of the peloton to shorten the breakaway's lead. At the intermediate sprint, Lemoine beat Elmiger, Gripel beat Kittel for fourth place, Peter Sagan placed eleventh. By here the gap between the peloton and the breakaway was just over 4 minutes. Andrew Talansky was dropped by the peloton, his injuries must of made it hard to keep up with the fast pace of a fast peloton. The young American quickly fell to 4 minutes behind the peloton. On the lower slopes of the 3rd Category Cote de Rogne, Anthony Delaplace was unhitched by the other two escapees. Unfortunately, Talansky looked like he was going to abandon the race but he sat at the side of the road for 5 minutes and just got back on his bike. TJ Slagter, Nico Roche and Jan Bakelants attacked and joined Cyril Lemoine, who was unhitched by Elmiger, to make up the 2nd group on the road. Martin Elmiger took the 2 points, at the summit, whilst Jan Bakelants took second and one point. Roche and Bakelants distanced themselves from the other two riders in the chasing group. The peloton quickly caught TJ Slagter and Lemoine whilst two Europcar riders attacked from the front as so did a Movistar rider also. Elmiger took 2 points on the summit of the Cote de Choux whilst Roche took 2nd. On the Cote de Desértin Roche and Bakelants caught Elmiger and Gautier with Herrada caught them to make a five man leading group. On the Cote d'Echallon, Nick Roche attacked off the front and Elmiger just fell off the back. Roche was riding the most expensive bike in the peloton - the Specialised McLaren Venge which cost about £20k. In the peloton, Scarponi and Serpa crashed at the back. All the other attackers were caught with 20km to go except Roche, who took two points at the summit of the climb. Tony Martin caught Roche on the descent with the peloton on his wheel. Rui Costa was distanced on a uncategorised climb. Whilst at the front, Tony Gallopin attacked on the undulation. The frenchman held a lead of ten seconds on the descent. Nicolas Roche was awarded the Combativity award for most aggressive rider. At the front, Rodgers, Kwiatkowski and Sagan caught Gallopin and distances themselves from the peloton. With 2.7km to go, Tony Gallopin attacked again and achieved a gap. 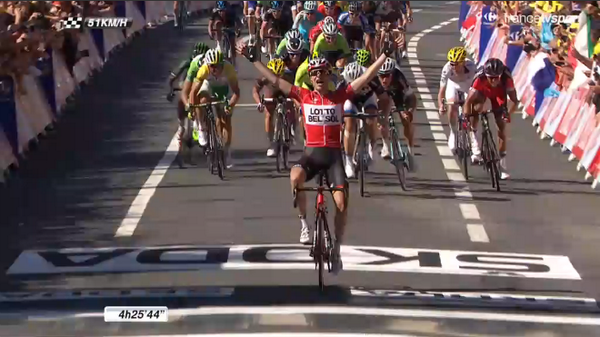 The chasing group hesitated and let Gallopin take a solo win from John Degenkolb who won a sprint right behind. Meanwhile Rui Costa lost a minute and a half on the winner.